The ALA just released the list of most frequently challenged books of 2015 and David Levithan’s Two Boys Kissing is in at number ten. Two Boys Kissing is the story of two boys who set out to win a Guinness World Record for kissing, as they try to figure out who they are and what they mean to each other. It’s based on real life events. Read more about why this book was challenged in this article from School Library Journal. We love the diversity this book represents. Come check it out, read it and tell us what you think. 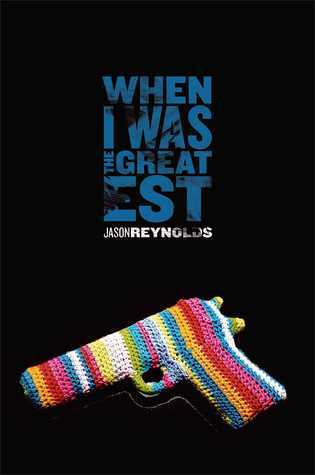 Parents in New York are upset about Jason Reynolds’ 2014 young adult novel, When I Was the Greatest. They say things like, “it’s inappropriate” and “I don’t want my kids to learn about guns.” The New York Department of Education recently added it to their recommended reading list. This book isn’t about guns. It’s about three friends facing the challenges of growing up in the city; family, friendships, all of it. Guns are present in the book, but the overall message is one of non-violence. The cover art is meant to be a statement to bring up questions and spark conversations about our world. Conversations we all need to have. That makes this controversy a good thing. Read more in this article from PIX11. Come check it out, read it and tell us what you think! Looking for Alaska, written by acclaimed young adult author John Green, was taken out of classroom libraries in New Jersey after a parent complained of sexual content. One parent. The superintendent removed it immediately after hearing the complaint. No process. No vote. He just removed it. This award winning book had been on the shelves for years before this happened. Other parents and students spoke up and it’s now back on the shelves. What does this say about the importance of your voice? What about your freedom to share it? Want to know more? Check out this article from the National Coalition Against Censorship. Read the book then tell us what you think! Source:(WP:NFCC#4). Licensed under Fair use via Wikipedia. The Absolutely True Diary of a Part-Time Indian by Sherman Alexie is the most challenged book of 2014. Folks think it’s inappropriate for students because (according to them!) it contains violence, sexual content and offensive language. What do you think? Is it right to keep people from reading books because some people don’t agree with the content? Should you be allowed to decide for yourself? Why or why not? Come check it out, read the book and tell us what you think! Want to know more aobut how and why are books banned and challenged? Here’s a nifty little infographic from the American Library Association.